I was craving a chickpea salad sandwich but most of the recipes out there are all very similar–usually to make it taste sort of like a tuna sandwich–and I wanted something slightly different. So I had some vegan daiya provolone slices and tomatoes, and thought making an Italian flavored chickpea salad would be good. 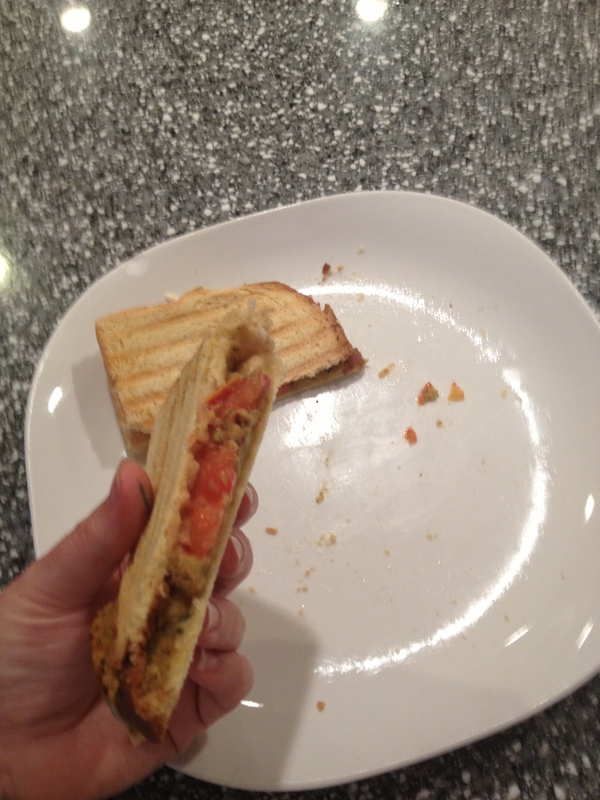 I decided to put it all in my panini press with some bread (duh). It came out really good, my only regret is that I didn’t put a slice of the provolone on both inside pieces of bread, because it would have helped the sandwich stick together better. I made the chickpea salad in the food processor, and pulsed it to the point where it was the texture of a paté or thick hummus. I think it might be good if you process the sun dried tomatoes with the olive oil and spices and then add the chickpeas and roughly combine, especially if you want to eat it in a cold sandwich instead of a panini. Otherwise, just put everything in at once until combined. If you want a smooth, thick, pasty salad, throw all the ingredients in a food processor and pulse until combined and/or desired texture is met. Otherwise, process sun dried tomatoes, oil and other dry ingredients except chickpeas until fully combined. Add in chickpeas and pulse until roughly chopped. It sort of depends on what kind of panini press/maker you have. (Mine does not require any additional spray or oil so that’s why I don’t mention it, but if yours does, please follow the directions and be safe.) Heat whatever you have until ready. In the meantime, prepare the fixings. Place a slice of the cheese on each piece of bread. Spread the Chickpea Salad on one side. Place tomato slices on the same side as the Chickpea Salad. Place the other slice on top, cheese facing down, and press in the panini until golden brown. I’d give the daiya Provolone slices a 4 good banana, 1 bad rating. It melts perfectly as do all their cheese slices, but the flavor isn’t exactly spot on. I give their nutritional yeast a 5 good banana rating! It’s the best tasting Nutritional Yeast (also known as “Nooch”) I’ve tried, and I can be quite picky with it.